This cake was one of my grandmother’s favorite cakes who lived in Dobrovich, Croatia before WWII. The house was originally owned by the Family Gutman. My grandfather was able to buy it from them and from then on they maintained it for their livelihood… You see they had everything they needed on this estate. They had goats, a couple of cows, chickens, pigs and bees for honey and people to take care of all these animals and a most wonderful gardener who took care of a vegetable garden, a fruit orchard and a beautiful park around their big home. Grandmother had maids that came every morning from the nearby village, to help her in the house and kitchen. My grandfather was a Waldmanipulant for the Gutman Werke. He together with eight hundred lumberjacks maintained the huge forests that the Gutmans owned. With that position he had many visitors, they were called Agenten (agents/sales people) from all over the world that came to the house for business discussions for buying lumber from the Gutman Werke. My grandmother prepared meals almost daily for up to 20 guests and that included her three children. My mother told me that they were always expected to behave properly at the table while the gentleman discussed business. Grandmother never excluded her children from a dinner table; she felt that they needed to learn early on in life to behave properly while adults were around. Deserts were always a special experience that my mother remembered since my grandmother learned to cook and bake from a Bohemian cook who worked for the Gutman family in Belisce. She became a baking expert early in life. 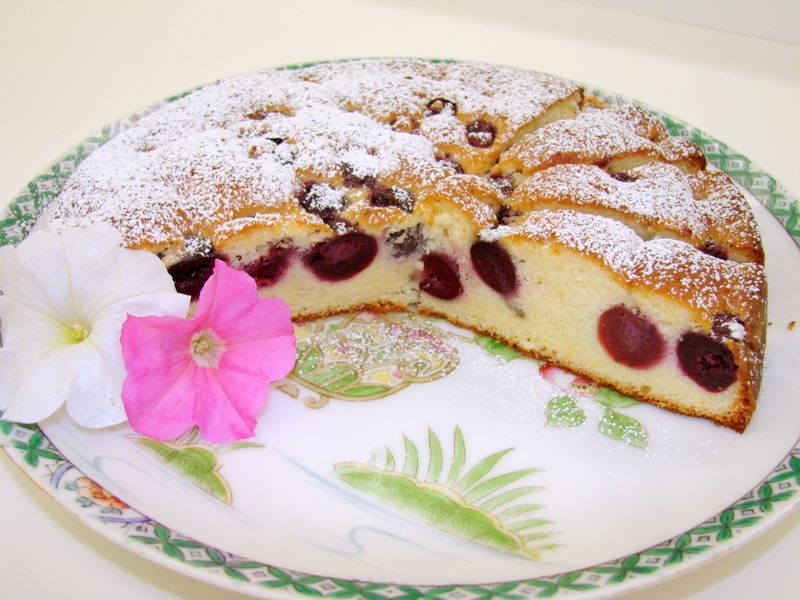 This Kirschen Kuchen was baked often during cherry season in Dobrovich. The big difference was that they had no electric mixer. Every batter had to be hand beaten and mixed. Can you imagine how long it took to beat eggs and sugar to be completely foamy….or egg whites to a soft peak? Try it sometimes if you are curious. I have done it. Note: Maybe some of you are a little confused about the connection I make all the time between Croatia and Austria. It is a little hard to understand when one is not familiar with European History. In this case, Croatia and Austria at one time were all under the Austro-Hungarian Empire, therefore Austria had great influence in the lives of people living in that area. Hungary was affected in the same manner. So many recipes that the Hungarians claim to be Hungarian, Austrians say that they are theirs, and Croatia is caught between these two countries. Many people moved around during that time crossing boarders and crossing their own nationality and identity. Since then countries have become their own again, but Kaiser Franz Josef, the Austro Hungarian Emperor is still lingering as a ghost in many kitchens and among the people in that area of Central Europe. 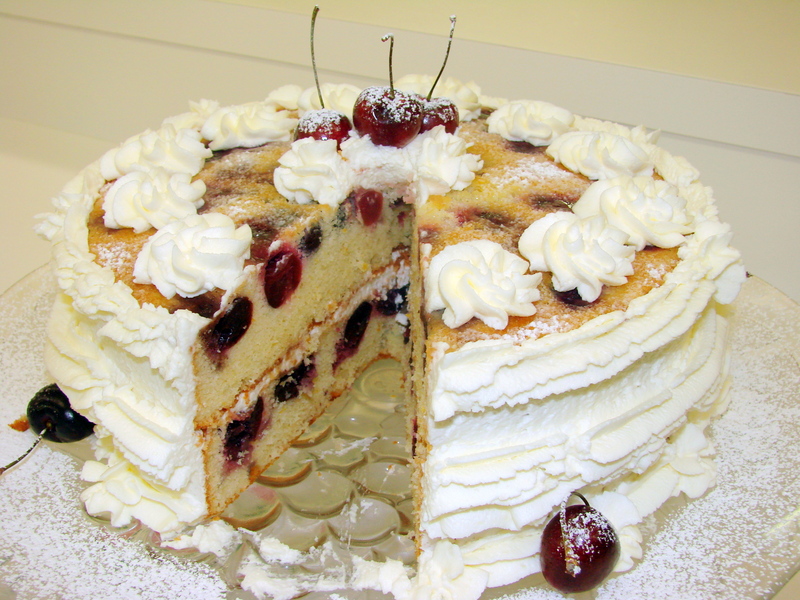 Here is the recipe for this very special Kirschen Kuchen that I ate many times when my mother baked it ….and to this day it is one of my favorite pastry. fancy cake for an Afternoon Coffee, a Fancy Tea or any special occasion! Cream the butter and sugar until very light and fluffy….this is very important! Add the eggs, warmed to room temperature, one at a time incorporating them well after every addition. Sift together the flour and the baking powder and add the orange zest. Mix the orange zest into the flour to coat it with the flour….that allows better distribution of the zest in the batter. In a separate small bowl measure out the liqueur and the milk. Now add to the butter mixture the flour and milk alternating them and mixing after every addition. Mix gently but thoroughly to make sure that all the flour is incorporated into the batter. Prepare two 9 inch baking pans: I use a parchment paper on the bottom of each pan and grease and dust the sides of the pans before I add half of the batter into the first pan and the other half of the batter into the second pan. 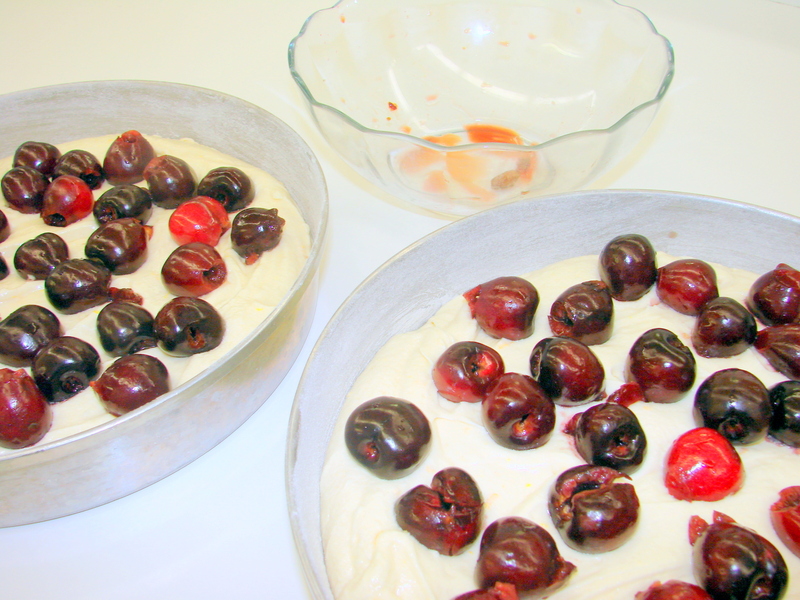 Place about 1 cup of the pitted cherries on top of each cake and bake the cakes at 350 F for about 30 to 40 minutes or until a toothpick comes out clean. Cool the cakes for about 15 minutes than invert them onto a cake rack to cool them completely. Place each cake on separate platters dust them with powdered sugar and serve them as a breakfast cakes for the special breakfast or brunch. However you can also serve this cake as a Torte, by placing the cakes on top of each other. 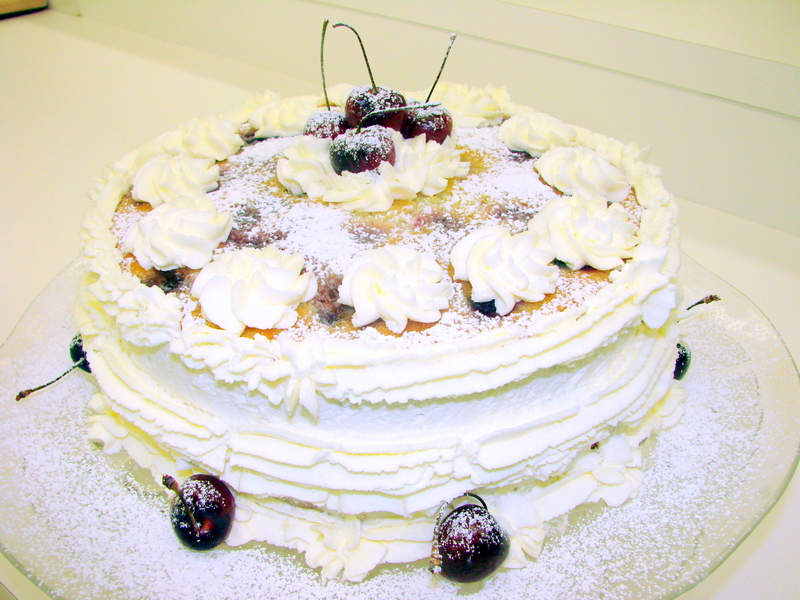 Brush the top of each cake with Cointreau and fill it with whipped cream and decorating it with more whipped cream and fresh cherries. You can subscribe to this blog, by finding the subscribe button in the upper right hand corner. All you need to do is submit your email address. This was originally a banana cake recipe that I received from my mother-in-law’s friend. I had to promise not to share the recipe until she had passed away. I loved the original cake very much. I loved its moisture, its flavor, but always felt it needed a little more than just banana pulp and chopped pecans. I wanted to have more to chew with every bite so that I could savor the flavors longer. 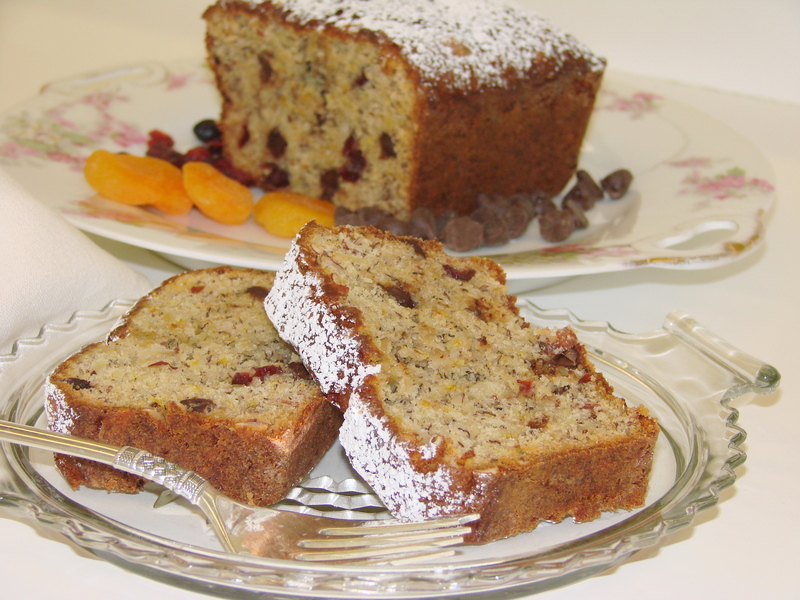 Every time I made it, and every time I sliced the loaf still warm and had that first bite and breathed the banana’s flowery fragrance the Austrian Bischof’s Brot came into my mind. My mother made an Austrian Bischof’s Brot for holidays. 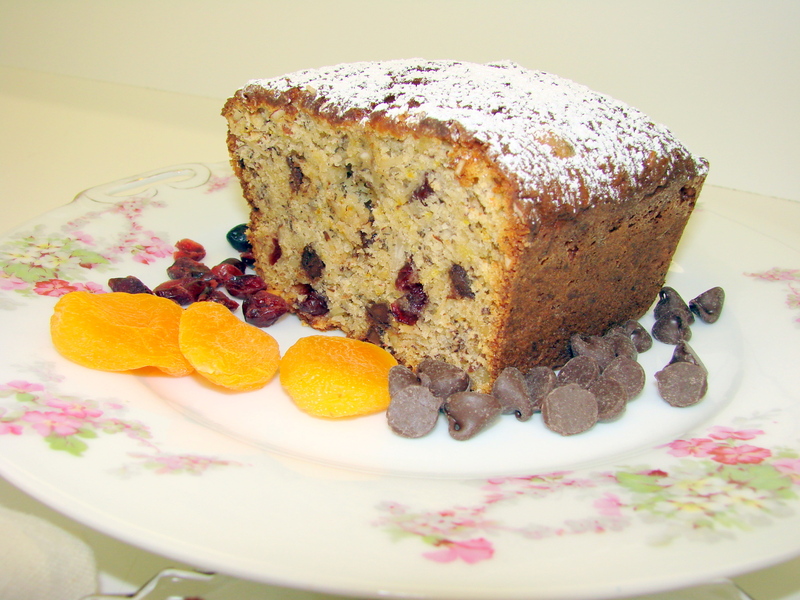 It was a yellow Vanilla flavored cake with lots of dried fruit to give it a solid, and chewy experience as one enjoyed it with that first sip of coffee. I felt that Mrs. Slater’s banana cake recipe would have the right consistency while enhancing it with my collection of dry fruit and some chocolate from the pantry. Note: You can add as many, and any kind of dried fruit as you like and have in your pantry or refrigerator. 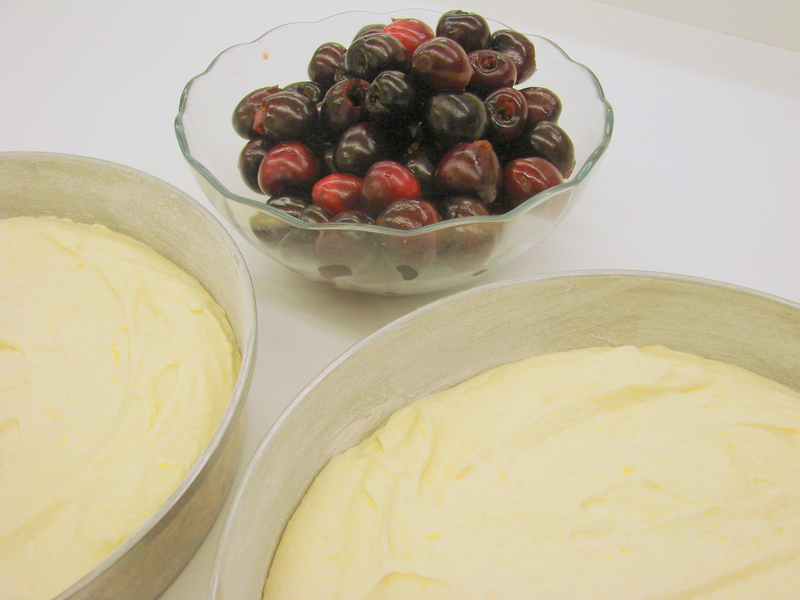 The batter is moist enough to handle any addition of fruit…. Cream butter and sugar until very yellow and fluffy, then add the eggs one at a time and beating them thoroughly. Mash the banana pulp with a fork and add it to the mixture above. Add the flavors and zest into the mixture next. Place a strainer over a bowl and sift the flour together with the baking soda. Add the flour mixture into the batter and mix gently but, well. Place the nuts, raisins, chocolate chips and chopped Apricots into a separate bowl, and dust them with a little flour by mixing them together. Now add the above mixture into the batter while alternating with the sour cream. Mix well but do not over mix. Bake the cake in loaf pans or a Bundt cake form – at 325 F until cake tester comes out clean, about 1 hr or a little longer. When baked let the cake cool and dust it with powdered sugar, then serve it with coffee or tea. 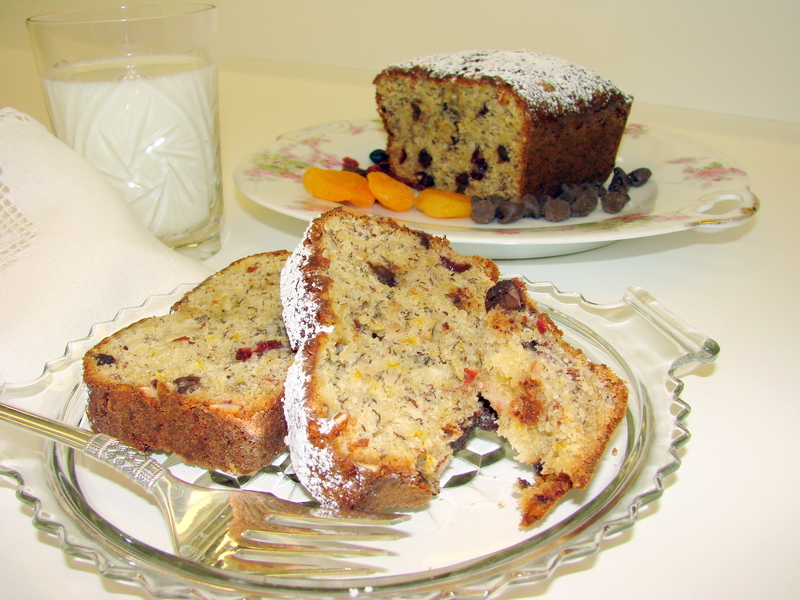 This is a very simple cake and following the recipe should not be difficult. Hopefully you will make it soon and enjoy it as I do. It would be nice to hear how it turned out in your kitchen and if it was liked to whomever your served it.